ISM (Indian School of Mines) Has Recruitment Notification Released For 02 Senior Research Fellow (SRF) / Junior Research Fellow (JRF) contributions. All incoming and interested potential candidates can offline Apply or before 05.08.2016 (5 August 2016). 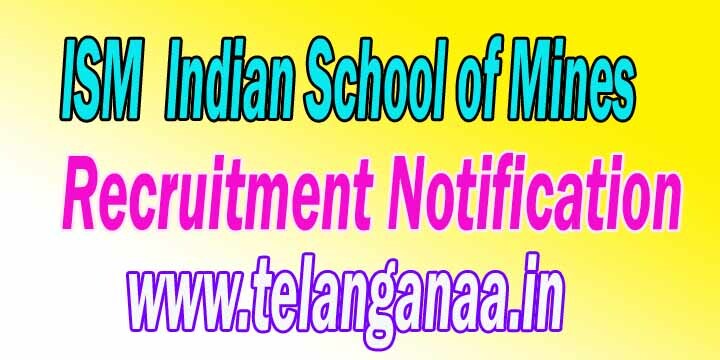 More detailed information on educational qualifications, age limit, selection, examination pattern, syllabus for ISM (Indian School of Mines) Recruitment 2016-02 Senior Research Fellow (SRF) / Junior Research Fellow (JRF) post mentioned below. Education - should have candidates Engineering Degree / Post Graduation degree or an equivalent qualification from a recognized university conducted. Pay Scale - Rs 28,000 / -. (SRF), Rs 25,000 / -. (JRF). How to apply - all coming and interested eligible applicants must hardcopy application along with relevant testimonials (Mentioned in the detailed display) to the following address before or on 5 August 2016. -Professor Address. S C Dutta, Principal Investigator, Department of Civil Engineering, Indian School of Mines, Dhanbad- 826,004. Application must be made to Latest From: 05/08/2016. Click here for ISM Detailed Advertisement.